ice fishing, originally uploaded by jahansell. It's official - according to the Lakeville Journal, Lake Wononscopomuc (I wrote that without checking - how'd I do?) is frozen over. 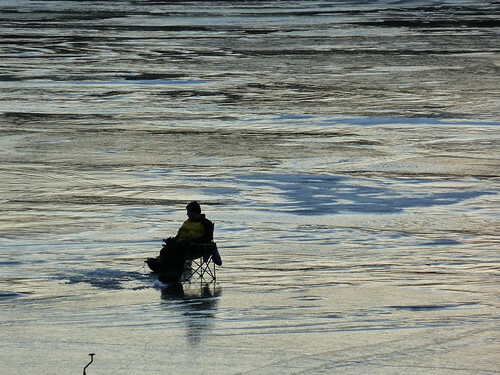 This gentleman is on Indian Lake, fishing just before sunset. Tomorrow I'll show you a pond that is mysteriously un-iced, and its denizens. Wow, guess that must be really cold! I wouldn't go out on that ice without a long tether! Come to think of it, I wouldn't go out there. Period.